From our second floor office we have a view dat we gaze out daily from to take a break from our monitors and it's almost like watching tv; you see da same thing but sometimes there's an entertaining show dat comes around. A few weeks ago provided about 15 minutes of ooh's and aah's as a Board of Water Supply crew (judging from da color of their shirts) was scoping out da road and our driveway. It's kind of a fun guessing game from our vantage point to figgah out wat's going on since we hear no sound and only able to "view" da action. So there are two workahs and one luna (boss) walking up and down part of da intersection and then on da main road. Let me just say dis. I am totally surprised dat no one got killed cause it was like shooting fish in a barrel da way these guys operated. Without giving out da exact location (for my safety 😉 ) I can say without a doubt dat it is a dangerous stretch of road wea cars come flying down because of da long straightaway and hea are these two guys - without regard for traffic mind you - standing on da nearest lane marking da location of pipes. 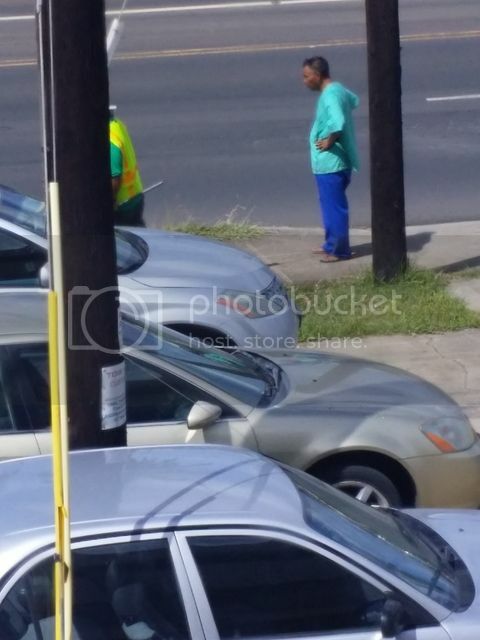 They moved from one lane to da oddah even to da middle of da road, up and down, left and right, checking manhole covers, back to da sidewalk, spraying paint on da ground all da while barely batting an eye or checking if they were going to be hood ornaments soon. I'm guessing da reflective vests they were wearing were da supah deluxe force field model as it was amazing how many vehicles barely saw them in time to stop or go around. It was a disaster waiting to happen and everything about their "job" seemed wrong. They had no cones up, they had no signs, no lookout was present with a hand held "Slow" sign to curb traffic nor was there anything "safe" about it.... except da luna. Can you spot da luna? Check out da two workahs with their BACKS to traffic and of course da luna supahvising. I swear it was like watching a human Frogger game and it was just a mattah of time before splat. You would think dat kine of work scope would have a partial lane blocked off with signage which begs me to ask why is da public required to jump through hoops before doing anything and it looks like an agent of da city can do watevah they like? Da luna not only appears to be wearing scrubs, he's wearing SLIPPAHS! I was tripping out! Maybe das why he couldn't go out on da road and help his guys out. Maybe he was a medical guy waiting for a medical emergency. Maybe he forgot his force field vest and refused to risk his life to spray paint da road. In any case, being da luna has its perks I guess. I was always a working Luna (acting Leaderperson) No can like this. At least he could hold one warning sign but "it's not in his job description" All to often I see county utility workers in the middle of the road without signage wearing that force field reflective vests. And yep plenty close calls but they no even flinch. I don't think that's the Board of Water supply crew. They don't work that way, safety is first and cones and signs would be out and no way the luna would be dress like that, dressing properly is expected. Typical union type operation, 2 workers 1luna. My mother asked me wen I was 1st grade what I was going tome wen I grow up? Be county road worker and marry school teacher. School,teachers were respected and made good pay, lazy guy like me admired county workers on county road maintenance crew. Being young not wise to ways.